When rain pelts the lone schoolhouse in Rudyard, Mich., teachers at the Upper Peninsula facility launch into a hurried version of musical chairs, hastily re-arranging students’ desks to dodge abundant leaks. At the same time, students are left to paint over nasty brown water stains that dot the school’s ceiling tiles. 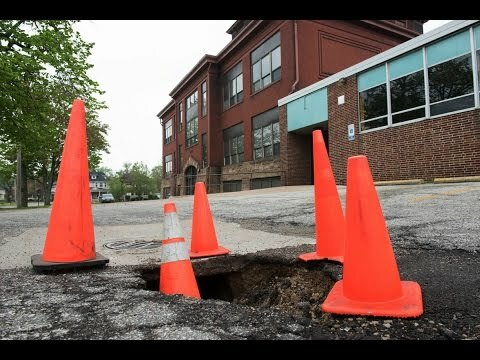 At Hamtramck’s Holbrook School, teachers cover busted lockers with brightly colored posters and paper while trying mightily—though often failing—to avoid stumbling over the broken tiles scattered across the school floor like road potholes. In the City of Muskegon, 100-year-old plaster covering the public high school’s walls has never been replaced, often flaking off in buckets and aggravating the lungs of asthmatic and non-asthmatic students alike. Each winter day, aging boilers struggle to belch heat through a labyrinth of old pipes and into buildings far too big for the shrinking student populations they hold. And in Beecher, a small unincorporated community outside of Flint, high-school students cram into classrooms in bunches of 30, even though the school's total enrollment is fewer than 250. But 250 students seem like more than enough when Beecher High has only five drinking fountains in the entire school—and no air conditioning at all. As distinct as these districts are from one another—whether in the rural expanse of the UP or the tiny town of Sodus or the hard-scrabble urban enclaves dotting southeast Michigan—the problems that confront their facilities are disturbingly similar. And these problems also are far more common to many other districts around the state than most Michiganders might believe. From the Straits of Mackinac to the shores of Lake Michigan to the dividing lines around Detroit, cash-strapped school districts statewide find themselves in an unending (and often intensifying) struggle to raise the money necessary to cover the single largest expense that any district faces—capital expenditures. Unlike “operations” costs, which pay for learning materials—books and academic tools from desktop computers to teacher salaries—capital-improvement outlays pay for the building, expansion and major upkeep of the school facilities. But unlike operations costs, which are paid for by the state, the capital expenditures are the sole responsibility of individual districts. And they also are a big reason why many poor districts struggle. As this photo essay produced by the ACLU of Michigan reveals, Michigan’s current capex funding scheme—or more precisely, the state's lack of a fair and sensible plan—has resulted in stark and disheartening disparities in the quality of facilities between tax-rich districts and their poorer counterparts, even among those that sit only a few miles apart. Looking at five tax-poor districts around the state—ranked according to their taxable value per pupil as of 2013 (the most recent year for which the figures were available)--we found teachers, administrators, students and entire communities engaged in a valiant battle to save their school properties from the ravages of time and dire demographic shifts. But no matter how noble their cause, it’s clearly an uphill fight. Public-school districts in wealthy communities such as Birmingham and Harbor Springs boast cutting-edge arts facilities, robotics labs and Olympic-sized swimming pools, the byproduct of higher revenues from their local tax bases. All the while, districts like Beecher and Hamtramck struggle just to keep the walls from crumbling around them inside facilities that are increasingly too old or too ill-fitting to effectively serve the districts’ needs. Furthermore, these top 21 school districts have a taxable value of more than $4 billion combined, although only seven of them have student populations that exceed 100 students and none have student bodies larger than 1,000 kids. This means that, because tax dollars for capital improvements are limited to the districts where they originate—rather than being distributed across districts—Michigan’s 21 most-affluent districts serve only 3,500 of the more than 1.5 million students in public-school districts statewide. This underscores the need to re-consider how Michigan funds capital improvements in its school districts. A formula that allows for a more equitable, statewide allotment of this money would certainly provide a financial boost for poorer districts, many of which serve student populations thousands of times larger than the most tax-rich districts. The five schools that this series highlights are amongst the lowest-ranking on the list of taxable values per pupil. Hamtramck Schools, for example, can yield less than $60,000 per pupil even though it services 3,100 students—or nearly the same amount as all 21 of the top districts combined. Districts without the local tax base to support capital expenditures—usually districts with large concentrations of low-income families, declining populations or an outsize number of low-tax properties—are forced to turn to hasty stopgap measures or dip into instructional expenses in lieu of sorely needed money to keep the buildings safe and standing. School districts have two main options when it comes to capital expenditures like major building projects or purchases, renovations and large-scale repairs: bonds or sinking funds. In the case of a bond, the local school district asks local voters to tax themselves in order for the district to borrow money, which comes with attendant debt-service costs. When a district opts to propose a sinking fund, it asks the local voters to tax themselves so that the money can go directly to the district, with no debt-service costs. In neither instance, though, does the state provide matching funds. This has forced many districts to make tough decisions, not just about what fixes to make first on a building but also about whether they can afford to make fixes at all. In 2005, for example, a study by the Education Policy Center at Michigan State University and the Citizens Research Council of Michigan estimated that unmet capital needs in Michigan public schools approached $8.7 billion. The problem has only worsened since then. Admittedly, raising money for school improvement is often a daunting task, no matter how flush the district or expensive the real estate. But state non-involvement only makes the problem that much more burdensome—and in some cases, virtually unsolvable—for districts without the population or the property values to fund a new playgrounds or the expansion of the auditorium or the improvements necessary even to comply with state handicap codes. For Andres Velez, superintendent, principal and maintenance director of the one-building Sodus #5 District, the challenge of keeping schools up to building codes (not to mention academic standards) illuminates quite clearly what he considers the only real solution to the funding woes.